With a 4-bedroom West Wing and 2-bedroom East Wing, Trulli Sulla Colina is like two villas in one and ideal for extended families and friends holidaying together. Both wings are pretty much self-contained, with their own living room, kitchenette and two shower-rooms each, plus there are sunny and shady patios, overlooking the pool, garden and stunning views beyond, for breakfasts al fresco and big family barbecues. 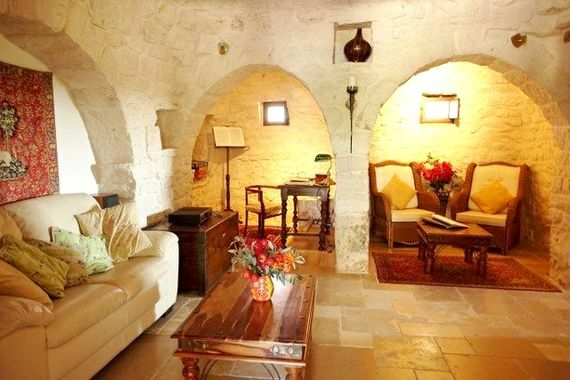 The villa is brimming with all the character and charm of the traditional trulli houses peculiar to this corner of Puglia, complete with quirky rooftop cones, vaulted ceilings, whitewashed stone walls and archways, which make the whole place more cosy and interesting for young and old. 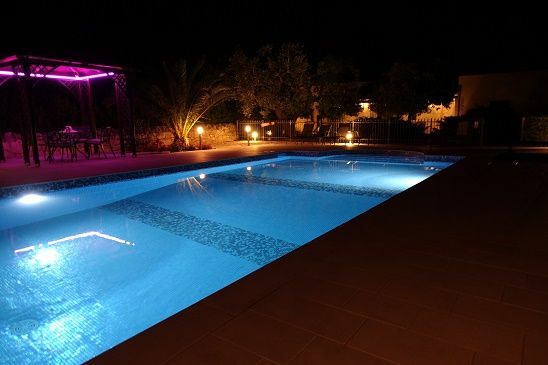 There’s also plenty to keep toddlers to teenagers happy from dawn ‘til dusk, so grown-ups can really relax, from a beautiful 10 x 5m solar heated pool to a games room, Wii console and Wi Fi inside and out. Trulli Sulla Colina stands in almost 3 acres of enclosed, landscaped garden where children can safely play on trikes, have picnics under Cherry and Walnut trees and search for scurrying lizards. The pool area is securely enclosed too, with a lockable gate, so children can’t stray into here unsupervised, but, while grown-ups soak up the sun on the loungers, youngsters can have fun with the pool inflatables or just splash in the shallows on the crescent Roman steps. A poolside pergola provides welcome shade from the midday sun and has a table and chairs for snacking and drinks. 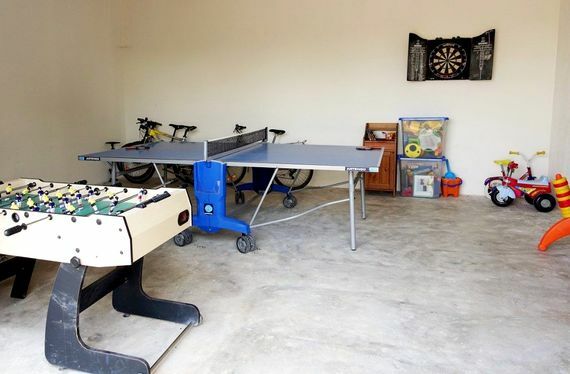 Besides playing in the pool, children can hang out in a cool games room, playing ping pong, table football and giant Connect 4, plus there are boxes of toys, puzzles and Lego to delve into. After all this activity, both the East and West wings have a flatscreen satellite TV and DVD player to flop down to watch one of the family films from the library and one of the TV’s has a Wii console with a variety of games. 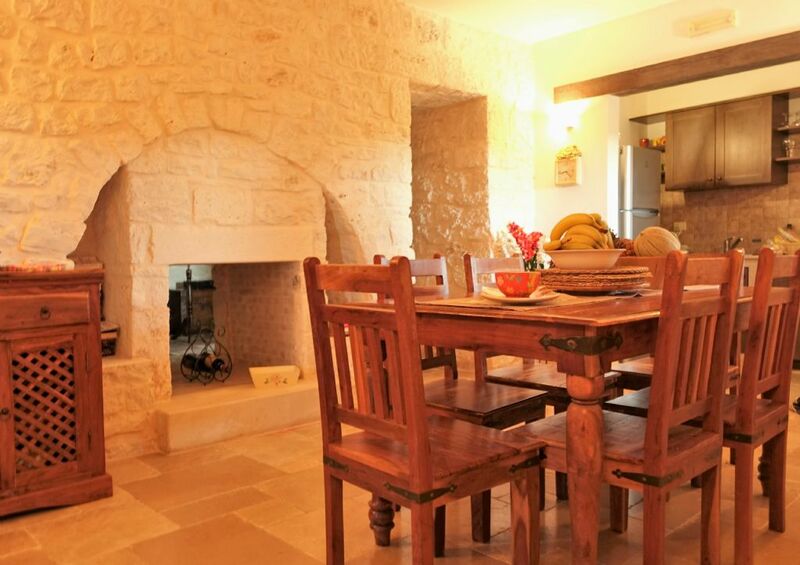 To make a holiday at Trulli Sulla Colina really special, and because Puglia is so renowned for its fabulous food, families can book a chef to prepare a feast of regional specialties or arrange a cookery course on making perfect pasta and pizzas. Bellissimo! 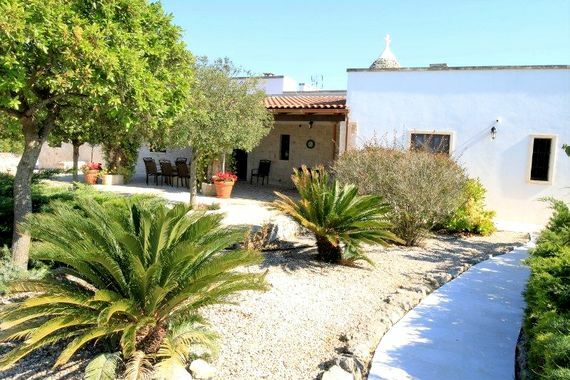 Trulli Sulla Colina sleeps 11 people, plus 2 babies in cots, with 4 bedrooms for 7 people in the west wing and 2 bedrooms for 4 people in the east wing. The west wing is the most spacious part of the trulli for families to get together, with a large open plan living/dining room which has an extendable table and a south facing terrace with a marble table for 11, overlooking the pool and garden. Beneath the conical trulli ceiling and arches of the east wing there is a super cosy ‘snug’ and both living rooms have comfy sofas for watching the satellite TV or DVD’s from the library. A Wii console is set up in the west wing and there is also an iPod dock. 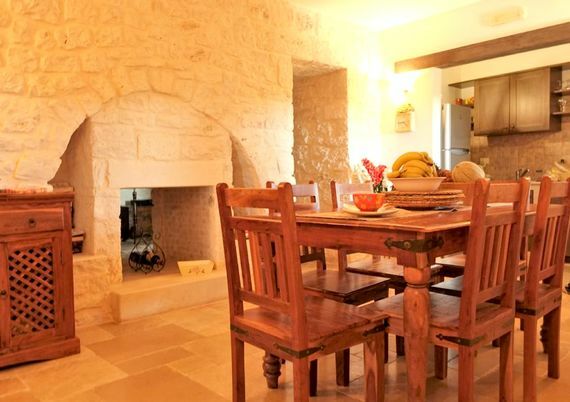 Both wings of the trulli have a well-equipped kitchenette with a fridge freezer, electric oven and gas hob, dishwasher, toaster and plenty of pots, pans and crockery. There is also a microwave in the west wing kitchen, which can be swapped into the east wing, and a hand blender and bottle steriliser are available. All the bedrooms at Trulli Sulla Colina are spacious and airy, with stone or marble floors, antique and wrought iron beds, luxury mattresses, Egyptian cotton linen and pictures by local artists. 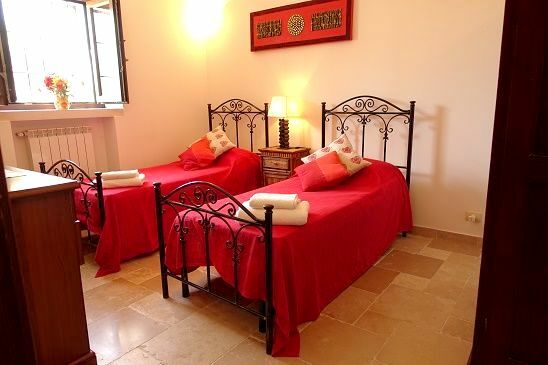 The west wing comprises two bedrooms with extra large double beds, one with twin beds and one single room. In the east wing there is one double room and one twin. One of the doubles in each wing has space for a cot and two are provided. Each wing has two shower rooms next door to the bedrooms and a baby bath is available. Way down in the heel of Italy’s boot, Puglia is one of the most unspoilt regions and still amazingly undiscovered, with whitewashed towns perched on the hilltops and a pretty coastline of fishing villages, coves and beaches. So renowned is Puglia for its array of home grown produce that its known as the bread basket of Italy and from simple pasta with rich vegetable sauces to Italy’s finest fish and seafood, foodies are in for a treat. 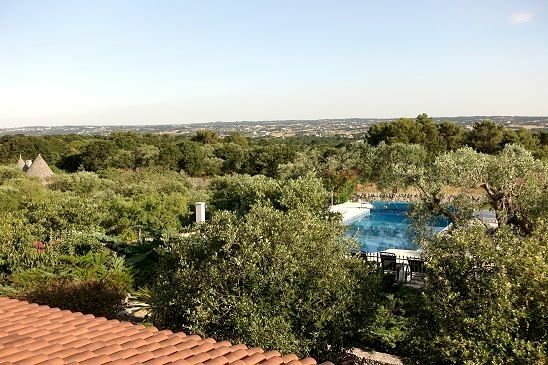 Trulli Sulla Colina enjoys a panoramic hilltop setting, overlooking the beautiful Val d’Itria and standing in 3 acres of almond and olive groves, just 5 minutes from the UNESCO world heritage town of Alberobello. This ‘truly’ unique town is made up of thousands of white-washed trulli which house all the shops, cafes and restaurants families could need, including arty gift shops, galleries, artisan bakeries and mouth-watering delis selling local cheeses, Parma hams and other goodies. The Thursday market is a must, not just for the array of local produce but also to soak up the atmosphere, and, to stock up on everyday provisions, there are two good supermarkets on the outskirts of town. 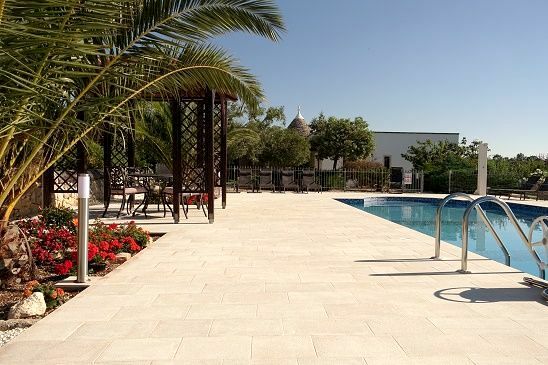 Besides all the charm and character of Alberobello, families can have a fun time too at the nearby Aqua Park Alberobello, with lots of pools and slides to suit all ages. To avoid the tourists in Alberobello, families also have lovely Locorotondo and the larger town of Martina Franca less than 10 kms from the Trulli. Locorotondo is officially one of the most beautiful villages in Italy - Borghi più belli d'Italia – and Martina Franca has a fine historic centre, both with plenty of shops, cafes and restaurants lining a maze of narrow, winding streets. Besides exploring Puglia’s pretty towns and villages, Trulli Sulla Colina is just 25kms from the Adriatic coast for lazy days on sandy shores. The beach resort of Torre Canne is just half an hour’s drive from the Trulli, with a beautiful sandy bay and sparkling shallow sea for children to paddle, plus plenty of beachfront cafes and restaurants to tuck into indulgent gelati and some of the finest fish and seafood in Italy. On the way to the coast, Zoosafari Fasanolandia makes a big family day out, with tigers, elephants, giraffes, hippos, monkeys and loads more wild animals to spot on the safari drive as well as roller coasters and rides in a theme park. Getting here: The nearest airports are Bari and Brindisi which are both approximately 75kms (1 hours drive). BA, Easyjet and Ryanair fly from the UK to Bari and Ryanair also flies direct to Brindisi. WE bought our trullo 14 years ago and really enjoyed restoring it. We really do take a pride in the property and re-invest yearly to continually upgrade and improve it. We keep on top of all the maintenance so that when we and are guests visit it is superb condition and we can relax and truely enjoy it. It is a wonderful holiday home that we use frequently ourselves bringing friends and family out to enjoy all it has to offer. We never feel we want to leave. The position and layout is what really attracted us to this particular villa. We looked at a number of properties but were after something really special that had panoramic views over the wonderful countryside and that we could easily access ourselves for walking or cycling which we love. 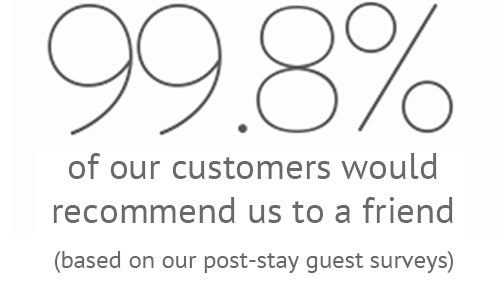 We have not been disappointed. The access is through beautiful country lanes surrounded by olive, cherry and almond trees with the most fabulous uninterrupted and panoramic views across the countryside to the Val D'Itria. The views are stunning by both day and night. It is just so peaceful - no traffic or aircraft noise at all. The only thing you will hear is the sound of hens, sheep and occasional dogs barking. We love the large roof top area and watching the sun go down is surreal. We love that it is secluded but not isolated. Our closest neighbour (Grazia and her husband) are situated nearby at the end of the drive - they are lovely people, elderly farmers who live a very simple life but are so welcoming of us and the effort we have put into restoring the trullo. 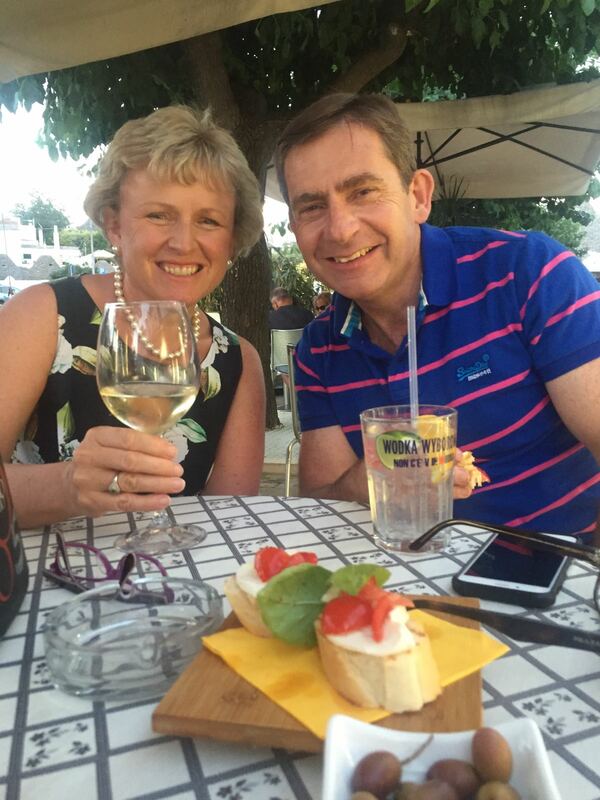 We love escaping from the pressures of the UK and relaxing in this very special region. The layout in 2 wings was unusual and a real bonus as we love holidaying with friends but also value our independence too, so this layout is the perfect answer. The nearest town, Alberobello is a delight - so unique in its' architecture and with its wonderful piazzas, churches and cobbled streets not to mention really good quality restaurants and cafes. 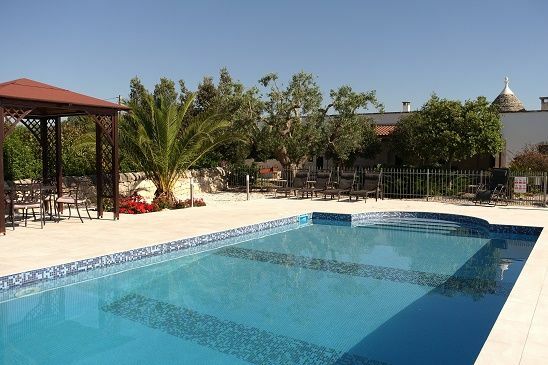 The kids just love the grounds with the pool and so much land to explore. The games room was something we set up knowing how much the kids like to be entertained but have to say as adults we too love the chance to play table tennis, darts and table football. When we holiday with friends we have alot of competitive fun. 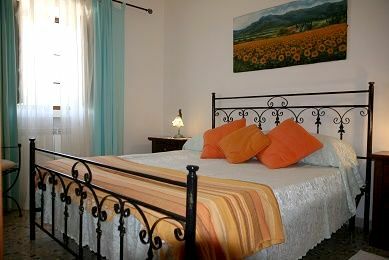 Sleeps 11 + infants in 6 bedrooms; 3 doubles, 2 twins and a single room. 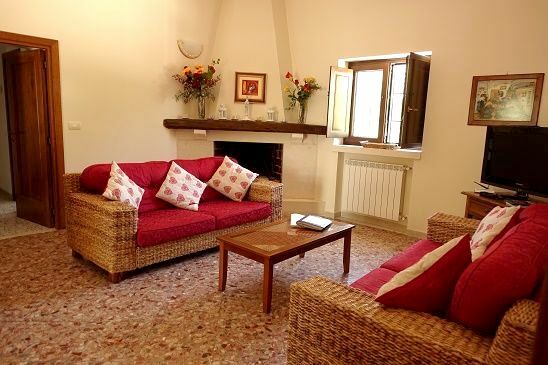 The nearest airports are Bari and Brindisi which are both approximately 75kms (1 hours drive). The villa has a private, solar heated pool (10x5m) with roman steps for easy access. The pool is set in a walled garden area and accessed via a lockable gate. The owner can arrange babysitting on request with prior notice. The owner supplies a handy selection of baby gear for families with young children. Items available include 2 travel cots, 2 highchairs, a bed guard, a changing mat, a baby bath, potty, booster seat, milton sterliser tank, baby monitor, blender and selection of plastic crockery and cutlery. A local chef can be arranged to cook at the property on request for special occassions. The owner can also arrange a pre arrival necessities shop for late arrivals. For outdoor play the owner provided a trike, toddler bike with stabilisers, a giant Connect 4, balls, inflatables, buckets and spades. A visting spa therapist can be arranged on request. The villa is set in private gardens. The pool area is enclosed as is the roof terrace (lockable gate). Wi-fi is provided at the villa. This property is in a spectacular location and was excellent for our multi generational family holiday. We all thoroughly enjoyed ourselves. The host was also always contactable when needed and provided lots of helpful information that helped us enjoy the area even more.